386 Miles in a Nissan Joke. 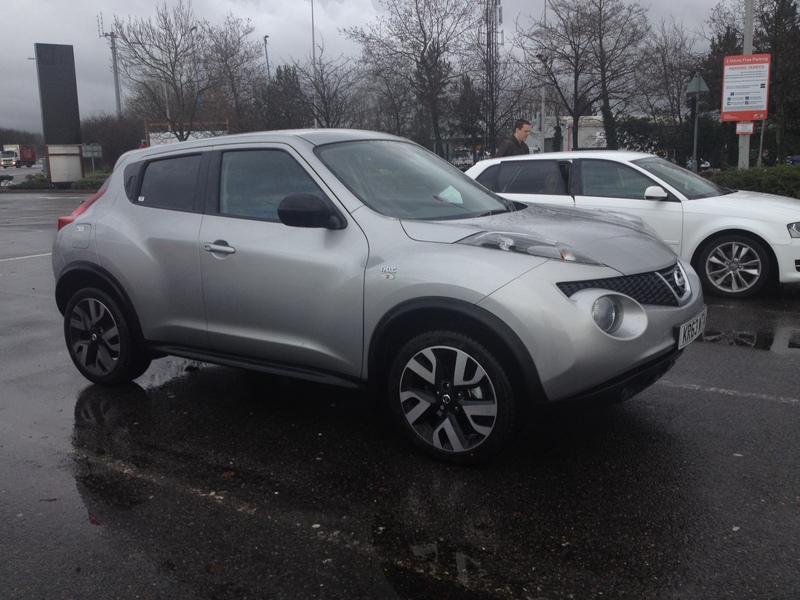 Sure, we have all heard about the Nissan Juke R and the Nismo R, but are you aware that there is a Nissan Joke Dismal available in the UK ? Until Hertz handed me the keys to one with just 1.4 miles on the ODO. The Nissan Juke 1.5 dCi 110PS Stop/Start has 81hp at 4000rpm and goes from 0-60mph in something like a month of sundays. Officially it does it in 11.2 seconds, but it feels slower than than. Much, much, much slower than that. It tops out at about 100mph. Again it feels slower than that too – 75-80mph is comfortable, beyond that I have no idea. Handling is dominated by almost entirely lifeless and over-assisted steering, in the rain I found that it was happy to under-steer on slippery roundabouts. There is no ‘steer it on the throttle’ as there is so little power that the chances of influencing direction is minimal to none. So, I hated it huh ? Well no actually, I didn’t hate it. I sort of fell in love with it. It has decent navigation, a nice seating position, the fit and finish is good, it held my luggage with no issue and it got me safely around the M25. It also has one of the nicest manual gearboxes I’ve used in a long time. The gear stick is fairly close to the wheel and has a really lovely super positive action. The design is funky and cool and visibility is excellent – the big mirrors are nice too. The engine though is a horrible thing, sure it is economical, but at what price ? The torque at low revs is good, but as soon as you rev it beyond about 3K, it all disappears and you are left hunting the next gear (there are 6). During my trip home I covered 386 miles and I did bond with it a little. Ok, I bonded with it a lot…. My initial impressions were dulled as it was stuck in some crazy Eco mode that was not exactly easy to get out of. There are three modes, Eco, Normal and Sport. There is a pretty vast difference once you take it out of ECO mode – it actually feels happy about revving beyond 3K – it will actually go all the way to the 5K limit – but nothing much happens beyond 4K other than it sounding horrible. Also once I stopped trying to drive it lazily and actually use the gears and understand that ‘slow-in, (relatively) fast out’ was the best way to drive it through the bends, it almost became fun. There is a road that I used several times, called ‘Aston Lane’, it is a winding, narrow, dangerous road, but in my younger days I knew it incredibly well. The first time I used it in the Nissan Joke, I realized that I was enjoying myself – on subsequent runs (10+) I started to get up to my old tricks, it went light over the rises, scrabbled out of the bends etc, so it really was fun on the right road. On Monday morning I jumped in to to head to LHR, the fuel computer said I had 110miles of range and the navigation said 124miles to LHR. I called in at a gas station and could not get the fuel filler cap open for the life of me. If I lived in the UK, I would probably want one….. The Top Secret Weight Loss Formula. Crash !